This topic contains 6 replies, has 3 voices, and was last updated by Gonzo 1 week, 6 days ago. Here’s my puzzle for April. If you prefer to solve in-browser, there’s a playable puzzle embedded on my blog. Happy to hear your thoughts. Hope you enjoy. EDIT. SPOILER! I’ve attached the answers as a png, but the browser’s giving a preview of it. I’ll email the webmaster to ask for it to be removed! This topic was modified 2 weeks, 4 days ago by TheVoidTLMB. Phew, Hamish has removed the solution – thanks! You can find the solution also over on my blog. I’ll make sure to use .pdf files here in future! This was good, though I don’t like the software on your online version – it skips characters that are already filled in in the lights, so you can’t just select a clue and type the answer if some crossers are done. 1ac The unchecked s/z of the variant spellings would be off-putting if this were a competition puzzle, but no problem here. 6ac The ‘one-pointer’ would be difficult for some non-UK solvers – but it’s your choice of who you are setting for. 10ac The PC Squad will be on your case. 11ac Even with the ‘in’ deduced, the space of ‘characters’ combined with ‘animals’ led me to leave this one as unsolvable without crossers. 13ac I got this one by pattern-searching but the parsing eludes me. 21ac I believe unnecessary past tense is deprecated – ‘holds’ still works. 22ac I took a while to see the homophone element here – the synonym just about works. 31ac Same as 6ac re non-UK solvers. 32ac Not sure the definition defines the answer. 3d I think you missed a chance to work ‘profit’ into the surface – “In excess of profit, we hear, she watches the workers” or something. 8d Very funny whilst only gettable from the crossers really. 27d ‘Tail-ender’ is a cricket thing, right? Seems a bit loose for rabbit, but there aren’t a whole lot of 5-letter preachers. This was fun! Contrary to Gonzo I actually think 2d needs no improvement. I laughed when I figured it out; I love the bathetic phrase “Fantastic one”. It was nice to see something other than “socialist” cluing “RED” in 6. I thought 13 was quite elegantly done, although I was thinking of Omar [Khayyam] so I didn’t get it for a while. 4 and 29 were both very neat too as Gonzo has already said. I had a couple of question marks. 31 across does something it hadn’t occurred to me to consider a problem until I saw a comment on Fifteensquared recently, which is using a homophone fragment for a non-word. The argument is, as SU isn’t a real word, we only know it’s a homophone of SUE because we know the SU in SUDAN sounds like that. In this case I don’t think it matters hugely, but since I saw that comment I’ve been thinking that rule/convention (if it is one) does make a lot of sense. The only other thing I was going to mention was the “Purgatory” clue. It was funny to solve, but I’ve been trying to put my finger on why I don’t think it quite works as a clue. I think basically the answer and clue would work better swapped around; DL would more intuitively lead you to PURGATORY. I see 13 now, but as written it clues IMURT. I think the homophone-for-particle problem is a non-problem. Thinking of words as collections of sounds is part of the solvers toolbox: think Spoonerisms. I recently used ‘Cockney’s mortal’ for the sound ‘leefal’. Since ‘leefal’ is not a word I can spell it as I please (within reason), so I used it for the letters LEEFUL. In the case of 31 here the solvers’ task is to think of a way of spelling the ‘sue’ sound, or to think of a country that starts with the ‘sue’ sound: Sulawesi,Sumer,Suomi?…seems fair to me. Thanks both for taking the time to solve and offering feedback! Gonzo – I hadn’t noticed that quirk of the software, but if you click the cogwheel, you can switch that option off. Now that you’ve pointed it out, I’ll see if I can set it to Off as the default next time, ta. 6/31 True. 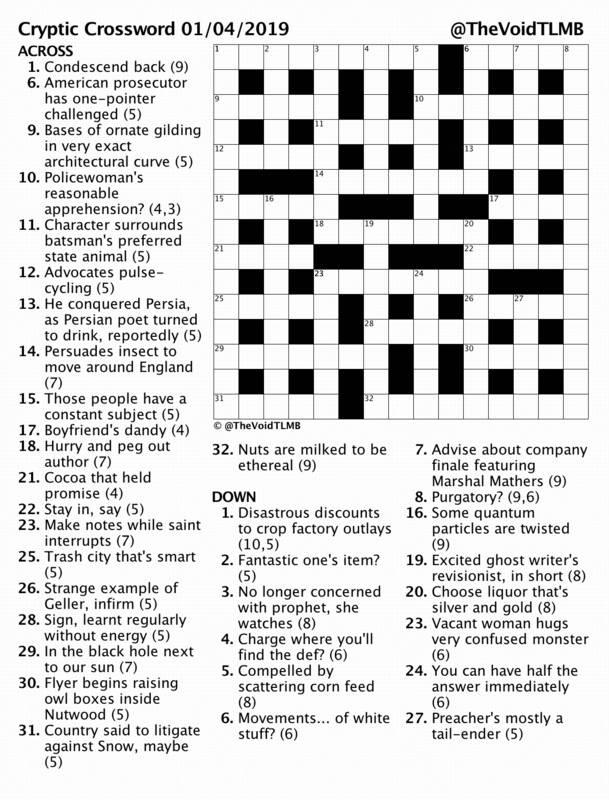 I decided that I’m a Brit setting Brit crosswords – unless I find reason (£?) to do otherwise. Maybe I should say so before each puzzle… but that seems a bit like overkill. 10a Heh, maybe. Too good a pun for me not to use. 21a Oh, you’re quite right. Why did I do that?! 32 “to be” were link words, as I saw it, leaving only the single word def, which I think’s ok.
2d I wondered about capitalising One, but that seemed too much a giveaway. 3d True! Amazing how often you (err, well, “I”) can fail to spot something right under your nose. 8d Glad you both thought it was funny. 🙂 How about if I offer this definition of Purgatory? : “A place where you are forced to wait until someone else in authority allows you to move on to somewhere else (that’s hopefully better)”. Seems to work for the answer too. I think chameleon’s right that it’s more gettable the other way round, and I did think for a bit as to whether it was fair. But I went for it, mostly for the humour. 24d Oh, another miss… I could’ve put “I’ve told you twice already. You can have.. etc” 🙂 I wondered if this sort of sneakiness was “allowed”. Maybe it is now! 27 Yes, cricket, where the two terms are synonymous. The homophone point is interesting. I’ll have to ponder that one. I haven’t been to BD44 for a while, but I see you’re both up there. Been a bit low on solving time of late (and I’m slow at it), but I’ll try to get to them both soon. Thanks again guys*, much appreciated! *…making an assumption, there. Send 10a round to caution me if needed! shows in the topmost results ‘XYZ (turning to) B’ only being used to clue ZYXB. So it may be a case of how libertarian do you want to go.